The Shakespeare classic about the mad and melancholy Prince of Denmark. Producer/Director/Actor, Laurence Olivier (received a nomination for Direction). Laurence Olivier / Oscared! (REBECCA, HENRY V, WUTHERING HEIGHTS, RICHARD III, FIRE OVER ENGLAND, SPARTACUS, THE BATTLE OF BRITAIN, SLEUTH, MARATHON MAN, THE BOYS FROM BRAZIL, A LITTLE ROMANCE). With Eileen Herlie, Basil Sydney, Felix Aylmer, Norman Woodland, Terence Morgan, Stanley Holloway, Anthony Quayle, and Peter Cushing. Lord Laurence Olivier (1907 - 1989) Distinguished British stage actor who was known as the greatest actor of his time. 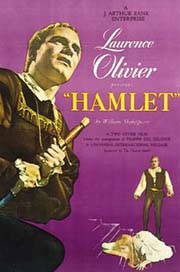 In addition to appearing in 1944's HENRY V he produced and co-directed it. He received a special Oscar for HENRY V. His other producer credit is for RICHARD 3. Roger K. Furse and Carmen Dillon received the B&W Art Direction Oscar. While Roger K. Furse was awarded the Oscar for B&W Costume Design. Please note: This British production was the first foreign made film to win an Oscar. Olivier found most of his cast from London's Old Vic Theatre. Jean Simmons was just 18 when she played Ophelia. John Gielgud supplied the voice of Hamlet's father's ghost.